Today we finally left Vaujany, it has been somewhere we have found very easy to stay, lulled by the routine of our days. 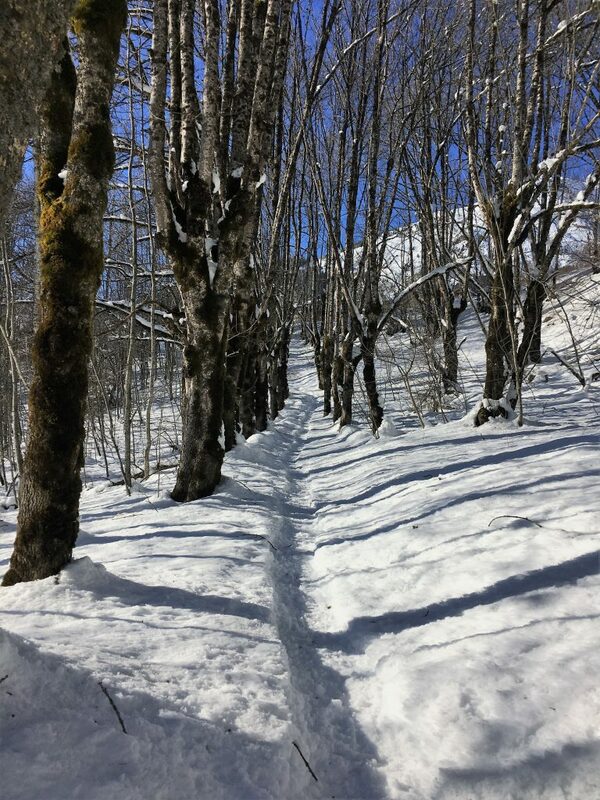 Skiing days involve popping up (via an elevator, a few short flights of stairs and a couple of escalators) to the supermarket to get any necessities, if we just need bread we might just stop at the sandwich stop and pick up a baguette – it’s a lot quicker. Then we have breakfast and make our packed lunches while debating what ticket to get – will we do a whole day or half a day? Will we ski the whole domain or just the local area? 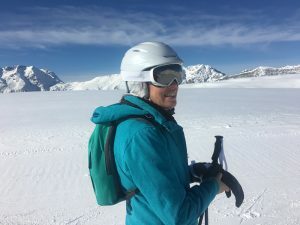 Armed with a rucksack, carrying our flasks of hot drinks, bottle of water, sandwiches and chocolate we head to the elevator and ascend to either catch the gondola or the bubble up onto the ski area. And we ski, not with any elegance, but we generally enjoy ourselves until we’re tired. Then we remind ourselves that we aren’t on a time limit, there is plenty more skiing to be enjoyed in the future. We aren’t on a week’s package holiday so we don’t have to eek as much time on the slopes out of every precious minute and end up with tired and broken bodies. We head back to Bertie, wash the sweat away, make dinner and settle in for the evening. There’s no apres ski for us, no hanging out in noisy bars drinking the local tipple, lift passes are eating up all of our budget. But we’ve got a supply of gin, wine and cider in the van if we want a drink and there’s enough interaction with other people on the aire to satisfy our need for conversation. Non skiing days (pretty much every other day, after all we aren’t made of money and although we’re intending to ski a lot we want to spread it out a bit) involve a trip to the tourist information office to see what events might be on. Or maybe we’ll head out for a walk/snowshoe or we’ll just go to the swimming pool and enjoy a leisurely swim and a shower with limitless water. Enjoying a walk in the snow? Then there is the shovelling of snow, the creation of clear paths around the van and to the service point. We take care to remove snow from the roof especially when the day time temperatures are above zero. Ice forms when melting snow from the roof re-freezes and this can be plain irritating as well as potentially causing issues, and we don’t want to drive away with a forgotten lump of snow on the roof. On snowy days the local snow movers come around to clear the aire, we’re last on the list unless someone is trying to get in or out. We didn’t quite realise how much snow moving would be involved in our trip. The aire in Vaujany is really well placed just below the main gondola station, where you can also get a smaller bubble lift up to the slopes. 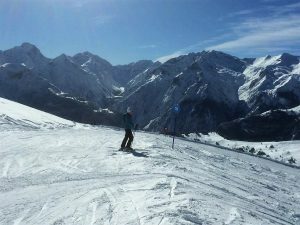 It’s a very short walk from the aire to the elevator which then takes you up to the lifts (the aire is on floor 0, floor 1 is a car park and floor 2 is the lift station) and the main ticket office where you can also arrange ski tuition as well as buying your lift pass. The aire has the usual water and waste facilities (no drive-over waste though), and the price includes very reliable 16A electricity. There are toilets either in the leisure centre building or accessed via the elevator on floor 1 and floor 2. There are only 10 spaces here and they are not all the same size due to the semi-circle layout, most vans under 8m will fit and you would probably get a larger van in some of the spaces. While we’ve been at the aire it has only been full for one night but the majority of people are here for a long stay so the max number of spaces we’ve seen is three. The cost is €15/24 hours, or €10/24 hours if you pay for 7 nights at one time, plus €0.33 per person per night for tourist tax. This means that if you want to stay for eight nights, for example, then you pay €85 plus tourist tax. There is a fairly new and temperamental barrier system where you pay in advance for your stay and get a receipt with a code that can be used to exit (and re-enter) the aire. You can also top up your stay using the code that is issued on your ticket. Note that we were erroneously charged the whole amount of tourist tax again when we topped up which we have chased up, not so much to get the piddling amount of money back but just because it’s a another annoying ‘feature’ of the pretty buggy software. The barrier often refuses to issue a ticket, we have found out that this is due to it erroneously registering that the aire is full. In this instance you need to go to the Mairie (town hall) and get someone to come down to sort it out. They don’t speak much English, so unless you are a good French speaker (we’re not) it’s easiest to go in person rather than phone, it’s sign posted from near the ski lifts. If, like us, you arrive on a Sunday you will need to wait until Monday morning. Alternative parking is either just above the aire on the side of the road, or down past the aire near the swimming pool and a few vans were using this for a free stay and then popping up to use the water and waste services at the aire which is close to the barrier so can be accessed easily. Vaujany is a steep village laid out on switchbacks which are cut through by elevators, stairs and escalators to allow you to easily climb to it’s highest reaches. On the level above the lift station is the Tourist Office, a number of ski rental shops, a couple of bars and restaurants and take away food shops. It’s quiet and family oriented, so the bars are low key affairs where people hang out for a quick drink after the day on the slopes. At the highest level are further shops, including the Sherpa supermarket which has all the basics at the usual slightly inflated prices (€1.50 for a baguette) and a self-service launderette (€6 for a 6kg wash, €3 for a 55 min cool dry). There is a free bus to the biggest local town – Le Bourg d’Oisans – where there is a reasonable sized Casino supermarket. Very close to the aire is the leisure centre building – it looks at first glance as though it’s a restaurant, but it’s not just a restaurant. It also houses an ice-rink and a bowling alley. If you enter this building and descend to the lowest level you will be able to leave and walk the short distance to the swimming pool, we used the pool a couple of times but not the other spa facilities. It’s a great pool, very modern with lovely panoramic windows looking out over the valley, a good kids area and slide plus a lane for length swimming, although it was never busy enough to worry when we were there. Men need budgie smugglers or tight swimming shorts as usual for French swimming pools. 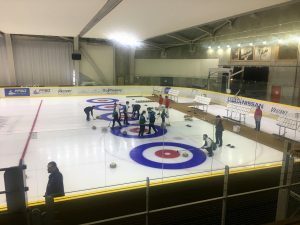 The ice-rink hosts local ice-hockey matches (not on while we were there) and curling as well as recreational ice-skaing. 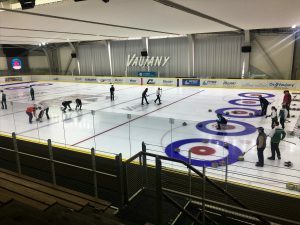 The French Curling championships were on while we were in Vaujany and we enjoyed an afternoon trying to make sense of the finals. The local ski area (Vaujany-Oz) skiing is mostly blues and reds, which suits us. There are a couple of blacks I cant comment on. There is a lot of off-piste skiing available of all levels. You can buy various lengths of ski pass including a very useful 4 hour pass which starts counting down from your first lift. If you get to the Dome des Rousses there is quite a lot of skiing to be done on the local pass, including nice long runs all the way down to Oz. But it can get icy down near the village as it’s not that high. The wider domain pass covers all of the Alpe d’Huez and the other sub-domains. There is no 4-hour pass but you can get either a morning (pre 12:30) or afternoon (after 12:30) pass. We found that it took us at least 4 hours to ski from Vaujany to the far side (Auris en Oisans) and back again. We didn’t really enjoy the extensive green bowl in the middle of Alpe d’Huez, but we did enjoy the Auris en Oisans and Villard Reculas areas. Maybe because they were less busy. In particular we loved the dramatic two-way lift that descends to the bottom of the Sarenne gorge before rising back up again, like a slow motion roller coaster. The top of the mountain (Pic Blanc) was mostly closed due to avalanche risk while we were there, once we got up to the top we found the runs very steep for our tastes, we ticked off the blues and red and got out of there. Lift passes are credit card style contactless passes and you have to pay €2.50 per person for them. You can pay an additional €3/person per day for insurance to cover you for rescue from the slopes in case of an accident (not any other medical costs though so you still need proper insurance). If, like us, you are buying passes on a day-to-day basis then there are special Saturday rates. You have to buy in advance to take advantage of the rates and the earlier you buy the cheaper it is. Once you have your card you can register online to top it up. We spent €200 each on ski passes for five days skiing. 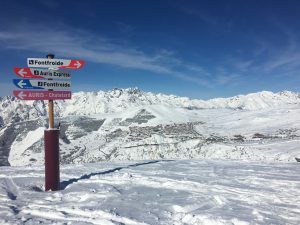 If you are staying for a longer time (and don’t have a season pass) then the most economical way to ski is probably to get the 10 non consecutive day pass for the local area (€285) and then topping up on the days you want to do the whole area. You might also consider moving to the aire at Auris en Oisans for a couple of days to ski the local area on the cheaper lift pass. One thing I forgot to mention when I first wrote this blog entry – the picnic rooms! These are heated rooms with picnic benches where you can take your own food and drink, a godsend for us budget conscious scrimpers particularly on a cold snowy day. These ‘Salle Hors Sac’ can be found in various areas, one at Montfrais, one by the main lift station in Vaujany and one by the ticket office in Auris en Oisans. In addition the pistes are liberally sprinkled with benches and picnic tables. You get the feeling that they understand how many people self-cater in this resort and are willing to accommodate them. There are plenty of marked and groomed snowshoe/cross country trails on the ski area and you can get good value ‘pietons’ lift passes. There are also walking trails in the valley (one of which can be accessed almost opposite the aire – look for the yellow signs). Be avalanche aware if you decide to follow these routes and if it’s just snowed you might not be able to work out where on earth they are! It was good to meet you in Vaujany this week and really good to read your blog. Very interesting and informative. It was good to meet you too. I hope you got your ABS issues sorted out. Conincidentally our ABS light was on as we left Vaujany. We’re hoping it was just a frozen sensor – fingers crossed! 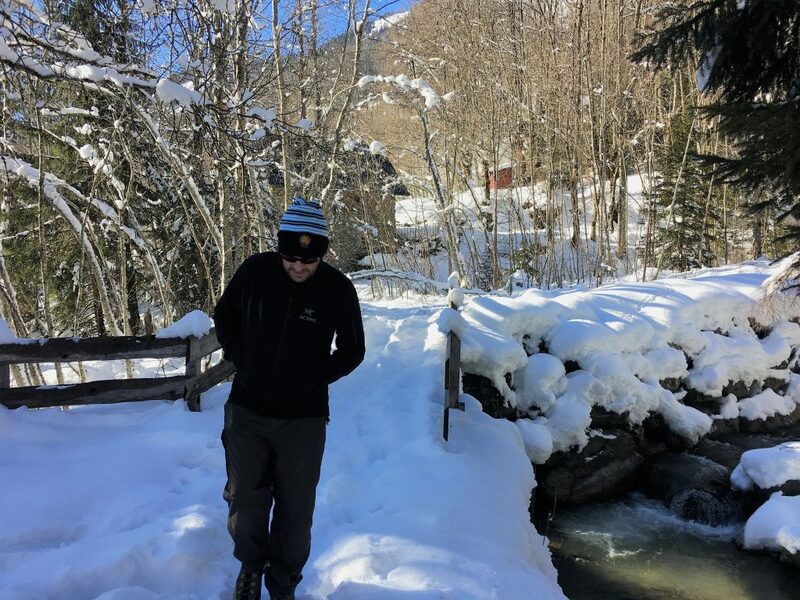 Only recently stumbled across your blog but delighted to see the ‘report’ on Oz-Vaujany and Alpe d’Huez where we go every January (well for the past six years). We stay either in Oz Station or in the village of Oz (Le Chateau d’Oz) as even though we are motorhomers our visits here have always been in the car. Thanks Ann, we liked the area very much. I can see why you keep going back.